RHYS: A couple of weeks ago, the BBC published a list of books that everyone should have read in their lifetime. There were 100 books on the list and they included the very weighty tomes like War and Peace, but also the more popular Harry Potter. I felt rather proud of myself because I had read at least 70 of the hundred books. When someone on another list published a different set of 100 books, this second list was more a compilation of world Classics, and I have to confess that I had only read around 50 of those. So this list got me thinking about my own work and why I wasn't included on either list. Okay, that is meant to be a joke. But I suppose any writer at one stage in their career wonders if they will write a book that will have enduring value. I know that I write books that are meant to entertain. They do interlude social concerns and an accurate look at history, but they are not To Kill a Mockingbird. Obviously, before I stop writing I would love to write that one definitive book. I would like to future readers to say "Oh, Rhys Bowen, didn't she write X? ", But I have no idea what that book would be. I enjoy what I write, I think I have a flair for humour and when I try to be too serious and too deep I depress myself. So looking at that list what is the one book that I wish I had written? I am very impressed with Byatt's Possession , and the way that she created a complete body of work of two fictitious poets. But that book doesn't really touch the heart. I'd like to have written something like Of Mice and Men, or a Tale of Two Cities and had my readers weeping by the end. But I think if I could write only one of those books it would have to be the Lord of the Rings. For me this was the definitive creation of a fantasy world and I have never attempted fantasy since I read it, because I know I couldn't do as well. So fellow Jungle Red Writers-- which book do you wish that you had written? HALLIE: The one I just read. ROOM by Emma Donaghue. It's a stunning work, written in the voice of a 5-year-old. Unputdownable. If I get more, I'll add: Pride and Prejudice, which is the ultimate, enduring CInderella Story. And the short story THe Lottery by Shirley Jackson which reminded humans about their mob mentalities. ROBERTA: Right now I think I will say Anne Lamott's book on writing, BIRD BY BIRD. Have you ever talked to a writer who hasn't loved that book? Somehow she managed to lay out the agony of writing while coming through as supportive and encouraging. It's not a great classic, but it's a book that has affected a lot of writers' lives. 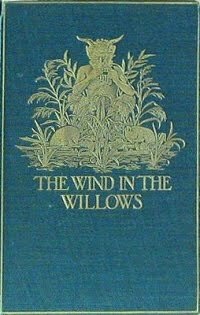 Okay, and here's one more: THE WIND IN THE WILLOWS. That book is a masterpiece! RHYS: I'm changing my mind and thinking maybe Harry Potter. Not only did she create a complete world, true to its own rules (although I do wonder why the world's most powerful wizard has to wear glasses), but she single-handedly got kids passionate about reading again. My additions: Snow Falling on Cedars, Sometimes A Great Notion, Handling Sin, Grapes of Wrath. If we are including short works, I wish I had written two short stories: Truman Capote's A Christmas Memory and F. Scott Fitzgerald's Babylon Revisited. This is so hard. Every decade of my life would a different answer. And every side of my brain...the reader..the mystery writer, the gardener..the woman of a certain age...the inner child. And of course, the books from the past don't always hold up as well upon rereading - and the current choices may not stand the test of time. So...ask me again in 20 years. EB - thanks for reminding me about Sometimes A Great Notion - I remember loving that! And I also think it depends what was going on in your life WHEN you read them, that explains why some of them have an enduring influence! I still think I'm going to write the book I wish I had written. Say, it's great to be this self-involved. I always have my best friend and biggest admirer right here. Merry Christmas from Jungle Red Writers! Write What You Know? Or...Who knows.